I am the first to admit that I am a reality TV fan. But I am selective in my program choices. I don't like the reality programs that are some sort of contest (except Survivor, but that is something completely different). What pulls me into a program is when you witness real people going about their daily lives, thinking that they are nothing special. And the dysfunctional family angle doesn't tarnish the allure. 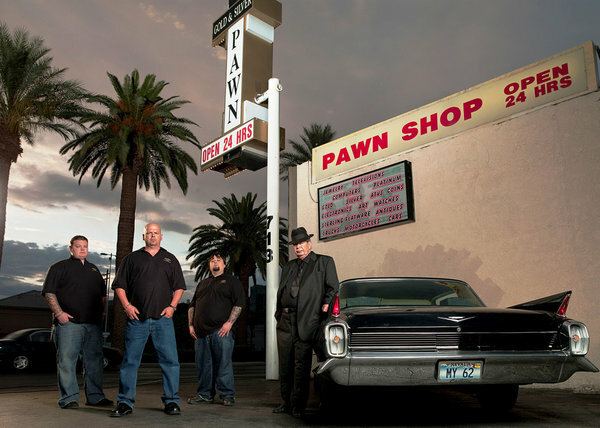 Pawn Stars is a program on the History Channel that is set in the Gold and Silver Pawn Shop in Vegas, run by the Harrison family. Between grandfather, father and son, this family business is anything but a quiet day at the office. The show, thankfully, is not focused around tourists so down on their luck that they are selling their wedding bands. There are no meth addicts tweaking out trying to pawn their shoes for a quick fix. Maybe there are, but that isn't what we see. People come in throughout the day trying to see if they hit the jackpot with the old coke cooler from grandma's porch or some gun they bought at a garage sale. The guys seem fair and they have a "buddy" that is an expert in anything and everything. It is fun to watch the "buddy" experts come in and offer insight and prices on everything from stamps to medieval armor. It will never cease to amaze me the items that people hang on to for generations. Pawn Stars is a great way to kill half an hour. You may learn a little about something random and take a peek through the window at another family. Maybe my family isn't so dysfunctional after all.